Frog the What Games has regrouped, refocused, and relaunched their Slaughterball Kickstarter campaign. 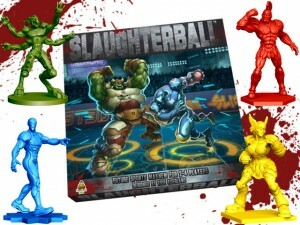 Slaughterball is a competitive board game simulating a ferocious future bloodsport where 2-4 teams of genetically-engineered super-athletes clash in a remorseless steel pit. Teams score points by making goals and injuring opponents. The rules are elegant and brutal, quick to pick up, but with the strategic depth to fuel endless hours of thrilling victories and agonizing defeats.